The VIP crowd that was being entertained at Athenodorus's country villa was delighted with the private games. Several other bouts took place in addition to the ones featuring they Ahenobarbus ludus. They wanted to see GALLUS fight again. 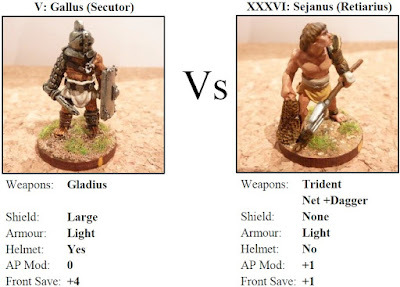 Governor Mucianus himself put up a special prize of 10 aureus to see GALLUS fight SEJANUS (Retiarius, skills: Reflexes, Stamina), another fighter considered an unlucky loser last time. Ahenobarbus and his fellow lanista are happy to agree, and the fight is set up for tomorrow evening. It is funny how the fights have had a consistent pattern that inexplicably fits the story line. In this case, yet again the audience was bloodthirsty. Also, both fighters have just come off a loss and were clearly carrying injuries. When I rolled for strength, I rolled 1 for Gallus – Strength 5. Then I rolled for Sejanus (higher of 2d6 due to stamina) and rolled 2 ones! (seriously), 5 strength as well. Clearly they were rushed into this by their lanistas and well underdone. Both suffered an AP drought (again, they were underdone! ), and kept their distance. Gallus got the first roll of 6 and just managed a frontal attack, causing 3 wounds. Sejanus was now injured, and did not roll enough AP to get away, but enough to get a wild throw of his net which missed by such a wide margin, onlookers were not sure whether it was just outright ineptitude. 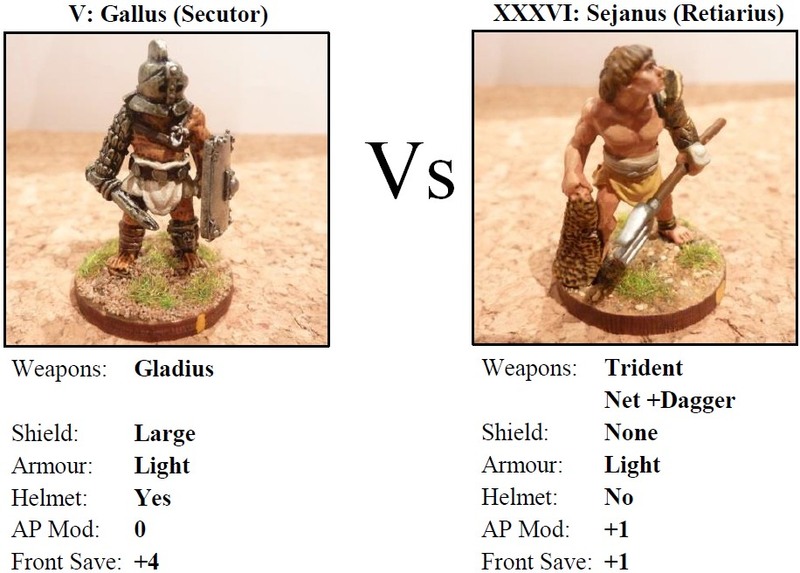 Gallus (also with low AP) did a few frontal attacks, a couple scoring 1 hit each to bring the hapless Sejanus down. By previous standards, quite a boring fight, but Ahenobarbus would have breathed a sigh of relief . When it came to the crowd roll, Sejanus rolled 7, +1 for being injured, but -1 for not inflicting any, and -1 for having no helmet. Final score 6, the audience was not happy…. Sejanus – lost 5 from 5, 1 fatigue, no crowd favour, LOST Missio roll. For a new skill, I would pick “Crowd Pleaser” (I need something to get the crowd moving! ).